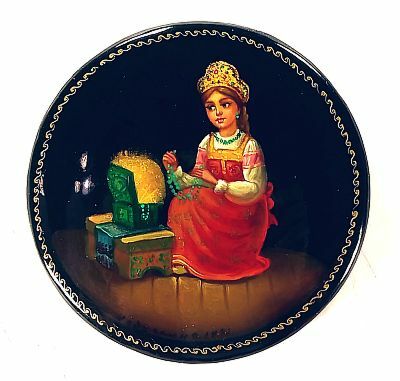 The girl Tanyushka opens the Malachite Box and takes out a green necklace. The box is magical and a golden light emanates from within. Tanushka is dressed in traditional Russian dress with a gold kokoshnik, adorned with jewels, on her head. The blackness of the background accentuates all the colors in the piece, and the girl has a very sweet face. There is a gold ornament that frames the miniature drawing. The interior is flat, and the box sits flat without legs. The name of the artist is written on the bottom of the drawing, along with year.